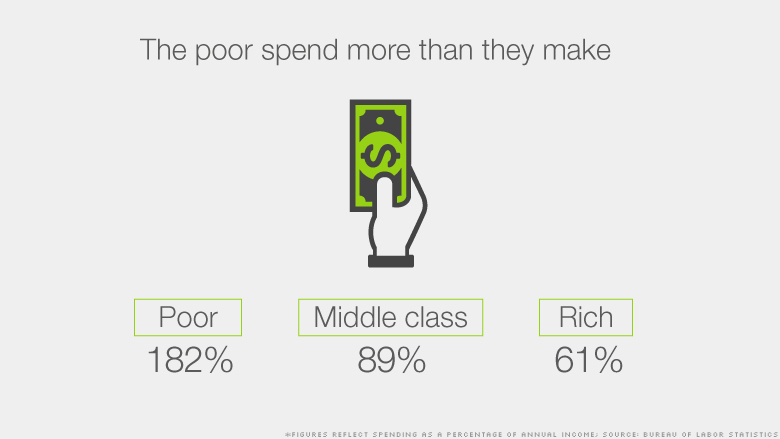 As a percentage of annual income, those in the bottom 30% of the income scale spend far more than they bring in. Low-income Americans are spending far more than they earn, forcing many to dip into savings, lean on family or go into debt. Those in the bottom 30% of the income scale make an average of $14,000 a year, including the value of many government benefits like food stamps or disability payments. But they spend more than $25,000, or 182%, of their annual income mostly on basic needs like housing, food and transportation, according to a CNNMoney analysis of Bureau of Labor Statistics data. Worth noting is that this group includes senior citizens, who supplement their income from Social Security with savings, and students, who turn to mom and dad for help. Also, research shows that some underestimate how much aid they receive from the government. But the data also includes many low-income families and individuals who just don't make enough to get by. Often, they have to decide what bills to pay or they turn to payday lenders or credit cards. "People are either making impossible choices or turning to high-cost credit or going into debt to meet basic needs," said Melissa Boteach, vice president of the Poverty to Prosperity program at the left leaning Center for American Progress. The middle class isn't doing great, either. While their annual income just barely tops $54,000, on average, they spend more than $48,000, or 89% of their earnings, a year. Meanwhile, the rich earn $166,000, on average, but spend only $101,000. This leaves them a nice cushion that they can sock away for emergencies or the future. 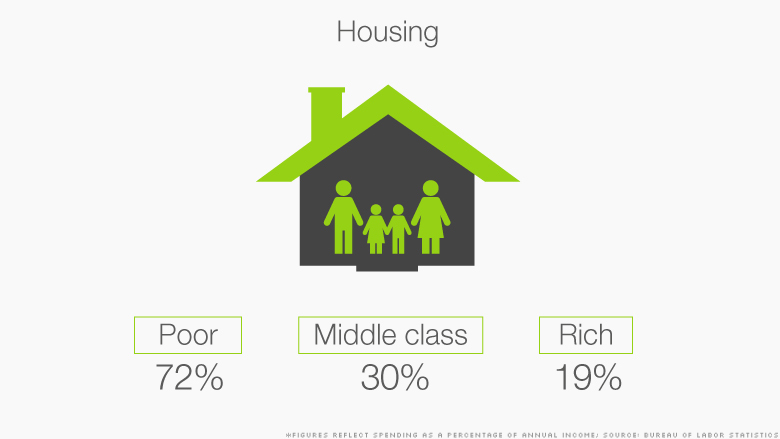 The poor spend nearly three-quarters of their annual income on housing alone. Keeping a roof over one's head is the biggest expense for everyone, but it eats up 72% of the poor's income. Only one-in-four eligible families receive housing assistance, she said. It's one of the federal safety net's most underfunded programs. 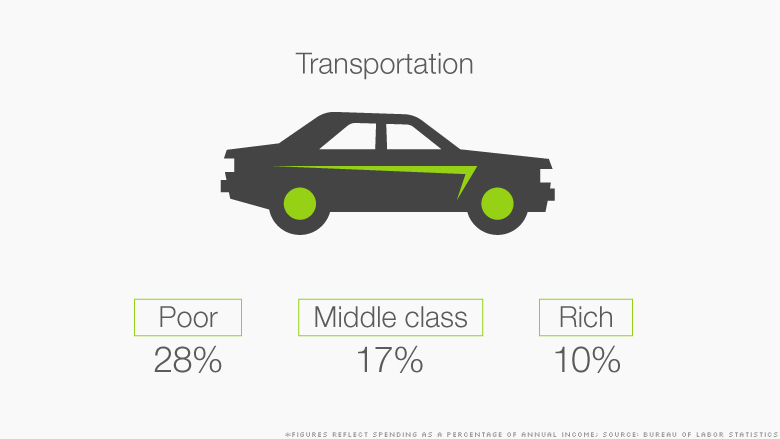 Spending on cars and public transportation can eat up nearly 30% of a poor person's annual income. Transportation is also a major expense for poor families, and there are no federal subsidies for it, Boteach said. It's often hard for low-income folks to get to their jobs, or even to grocery stores or day care centers. Some must take two or three buses -- that is, if public transportation is even available. And a car can be costly to buy and maintain. Even when accounting for government benefits, like food stamps, food is still a major expense for the poor. Many poor families can't afford to put food on the table every day. 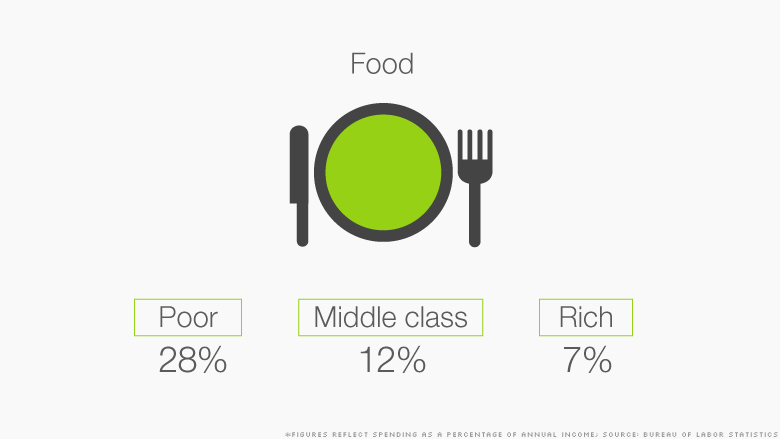 They spend 28% of their income on food, with meat, eggs, fresh fruits and vegetables proving particularly pricey. Food stamps don't last the entire month, especially after benefits were cut last November, Boteach said. This has forced more families to rely on food banks. More than 17% of Americans said in 2014 that they lacked money at times to buy food over the previous year, according to a survey by the Food Research and Action Center released earlier this month.